Award-winning investigative journalist Khadija Ismayilova called Azerbaijan's government a "repression machine" at the close of her trial on corruption charges Monday, dismissing her trial as a "scam" aimed to silence her. Before she was cut off without finishing her remarks, the contributor to Radio Free Europe/Radio Libery told the court that her reporting proved President Ilham Aliyev had "squandered [the] state budget and his family members were direct beneficiaries." Her investigative work has probed the alleged vast riches amassed by Aliyev and his family, leading to her arrest in December on charges including embezzlement and tax evasion. Ismayilova's supporters say the charges against her have been concocted by a government anxious to silence one of the few voices of independent journalism in the oil-rich former Soviet country. 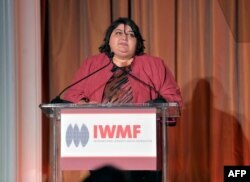 Ismayilova, who has won awards for investigative reporting on high-level corruption in Azerbaijan, said the charges of libel, tax evasion, illegal business activity, and abuse of power are politically motivated retribution. "Shame on you! What kind of a state is this? Even your cheap tricks did not work in building a criminal case against me," Ismayilova said in the final statement, according to a copy of prepared remarks that was obtained by RFE/RL. She was unable to deliver the last section of her statement - in which she was to thank supporters and wish the judge a pleasant vacation following the trial "without an aching and silenced conscience." Ismayilova vowed Monday that even a lengthy jail sentence would not stop her from speaking out, her lawyer, Fariz Namazly, told the French news agency AFP. "They won't be able to force me to stay silent, even if they sentence me to 15 or 25 years," she said, according to Namazly. A verdict had been expected Monday, but it was postponed until Tuesday. Lawyers and others who attended the trial described it as a tense session in which the prosecutor repeatedly called on the judge to stop Ismayilova after she mentioned President Aliyev. Representatives from the embassies of Germany, the United States and Norway were present during the proceedings, but many journalists and representatives of international organizations were not granted access to the small courtroom in the capital, Baku. State prosecutors requested a nine-year prison sentence for Ismayilova. If she is convicted, the judge could announce her sentence immediately or schedule a further hearing to do so. Critics have accused Aliyev of muzzling dissent and jailing opponents, citing Ismayilova as an example. Rights advocates, Western officials and media watchdogs have repeatedly called for the release of all imprisoned journalists and free speech advocates in Azerbaijan, including Ismayilova. Several journalists and rights activists were sentenced to prison terms last year in Azerbaijan on charges including tax evasion, illegal business activity, and hooliganism. 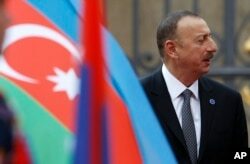 Their cases are widely seen as part of a government-led crackdown on dissent in the former Soviet republic in the South Caucasus, which Aliyev has ruled since he succeeded his father as president in 2003. RFE/RL's Azerbaijani Service contributed to this report. Some material for this report came from AFP.